This Light Award is sponsored by Mastery of Fate, by Christian Larson, and processed through Kiva.org. Guljamal is a member of this group. She is 52 and unfortunately, she is a widow. She has raised four children. All of her children except the youngest son live independently from Guljamal. Ten years ago, with an initial investment of 2,000 soms, Guljamal started a wholesale fish business. 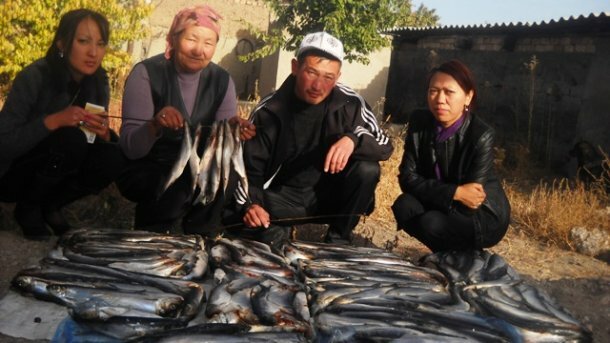 She supplies fish to the stores and in this way, she earns about 12,000 soms per month. This profit made it possible to save money to purchase a vehicle for her son. At the moment, she needs money to purchase clothes for herself. Thus, she applied for the loan from “Kiva”. In the future, she hopes to expand her fish sales business and plans to invest money in cattle breeding. Congratulations to Guljamal and her group.